Thoughtful acoustic folk songs featuring rich storytelling about people and their lives. 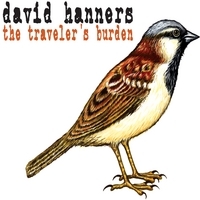 Pulitzer Prize-winning songwriter David Hanners mines a lot of territory for the 12 songs on his new release, The Traveler’s Burden, but at their core, the songs share a common thread: The people in them are survivors. “Some of the people in these songs make the right choices and wind up OK, but some make the right choices and things turn out badly. Others just start out doing the wrong thing. I’ve known all of these people,” David said. There are a variety of stories on The Traveler’s Burden. There are the tormented protagonists of the title track and “When My Demons and I Come Home.” “The Price Was Too Much to Pay” is a haunting murder ballad that sounds like it could’ve been written a century ago. Yet there is the modern outlaw’s lament of “Westfield Blues,” the story of an unemployed factory worker who runs a meth lab on the Illinois prairie. David never strays too far from his rural roots – witness the tale of his hometown in “13-Year Cicadas” – but he also ventures into urban territory for “The Ballad of Mohamed Saleh,” the true story of a Somali immigrant who fled the anarchy of his homeland only to die from senseless violence in the city streets of his new home in Minnesota. The songs aren’t all gloom-and-doom, though. “The Red-winged Blackbird’s Tale” is an upbeat reminder that true love can be found. The Traveler’s Burden was produced and engineered by Richard Lee, who also plays violin on several tracks. David played guitar and mandolin. Lonnie Knight and Bob Nordquist – great songwriters in their own right – lent their talents on guitar and harmonica, respectively. The record also features Jon Olson on bass, Daniel Zamzow on cello, Tod O’Donoghue on fiddlesticks and Nemo on oud. Amy Brockman added some great harmonies. David and I are friends. I played some harmonica on this CD and he played mandolin on mine. So take this with as many grains of salt as you need, but the friendship for me was built on the great respect I have for his songwriting. He’s the only songwriter I know whose opinion I value enough for to bring my unfinished work for an honest critique. Because of this I have been given an insight into the songwriting process of this thoughtful and creative artist. David and I have at times joked about which of us has killed off the most characters in our songs. (David took a leap ahead on this CD with a body count of 108 by my count). In David’s case I would argue that he hasn’t killed off 108 characters as much as he has brought them to life. These are not murder ballads that glorify death. These are dramatic stories of people to whom we can relate, with sometimes tragic endings, but always waging brave struggles with forces beyond their control. These characters, whether real or fictional, take life because of David’s attention to detail. By day David is a reporter for a local newspaper. The same gifts for digging up facts and presenting them in colorful, yet succinct words that earned him a Pulitzer Prize are displayed in this CD on twelve songs that will leave you wanting more. The CD opens with the title cut, “The Traveler’s Burden.” The sparse and eerie treatment leaves plenty of room for some brilliant guitar work by Lonnie Knight. Just when we start to sympathize with the, “weary business traveler” we learn the dark details of his, “business.” According to David, the opening line of this story about the serial killer along Interstate 70 in the early 1990’s was inspired by a Will Ferrell sketch on, “Saturday Night Live”. I trust SNL took it in a different direction. “The Price Was Too Much to Pay”, could have been a plot of a Shakespeare tragedy if The Bard had conceived of such a place as Cumberland County, Illinois. It shows what a destructive power love can be if someone is willing to use it against you. This has love, greed, deceit – all the elements of a great drama. David will often take you into the minds and hearts of killers and victims, but in “The Ashes of St. Anthony” you move on with the life of a man who has lost his wife and newborn son in a fire. This song is based on another true story, of hospital fire that killed 75 in Effingham, Illinois in 1924. “Tex Thornton” is a rocking blues number that puts you in a “’48 Chrysler flying down Route 66” and ends with the murder of a famous fighter of oil well fires by a jealous man. Quentin Tarantino should direct the video. It has fast cars, dynamite, roadside motels and a murder of course. My personal favorite on the CD is, “The Ballad of Mohamed Saleh”. This is a heartbreaking true story of a man who grew up in Mogadishu, Somalia. He survived all the horrors of war and a country falling into anarchy, just to wind up in Minneapolis driving a cab where he was killed in a robbery for $87. It’s another example of David breathing life and meaning into a character who otherwise died a sad and meaningless death. The addition of Oud on this track is brilliant. It is beautifully played by Nemo. It accents the clash of cultures even while blending in perfectly with the song. David, Nemo and Ric Lee, who recorded and produced this album, should be proud of this gem. In all these are twelve touching stories of life in the Midwest. It’s the history my teachers should have taught me. The care that David and Ric and all the guest musicians took in recording this CD, reflect the compassion David has for the stories he tells and the lives that he has shared with us.